Own ME3? Get the Armor. No Preorder - Co-Op Friendly. Having finally finished Dead Space 2 this weekend and wrapped up the Dead Space 3 demo, I'm fully in anti-necromorph mode. I was looking at a turkey on the dinner table last night and imagined myself using a plasma cutter to dismember...I mean...carve it. With Dead Space 3 only a few weeks away it won't be long till I get my fix and dinner will once again be safe. Today Electronic Arts have announced that owners of Mass Effect 3 will unlock a special bonus outfit in Dead Space 3 simply by having a save file on the same device as the game. 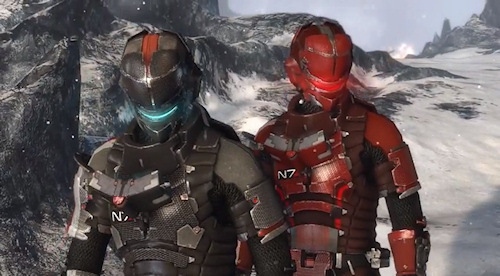 The N7 themed armor looks pretty darn slick and both Isaac and John have their own versions making it perfect for a stylish co-op duo. After all, it's important to look your best when severing the limbs of the undead. Dead Space 3 is out on February 5th on the Xbox 360, PlayStation 3 and PC - it features two player online co-op.